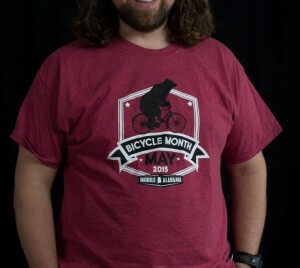 Bicycle Month t-shirts are now available. Order online, be sure to arrange a pickup location. Friday May 15th is National Bike to Work Day. To help encourage people to ride into work, we’ll have free breakfast Bienville Sq in Downtown Mobile from 7-9am. 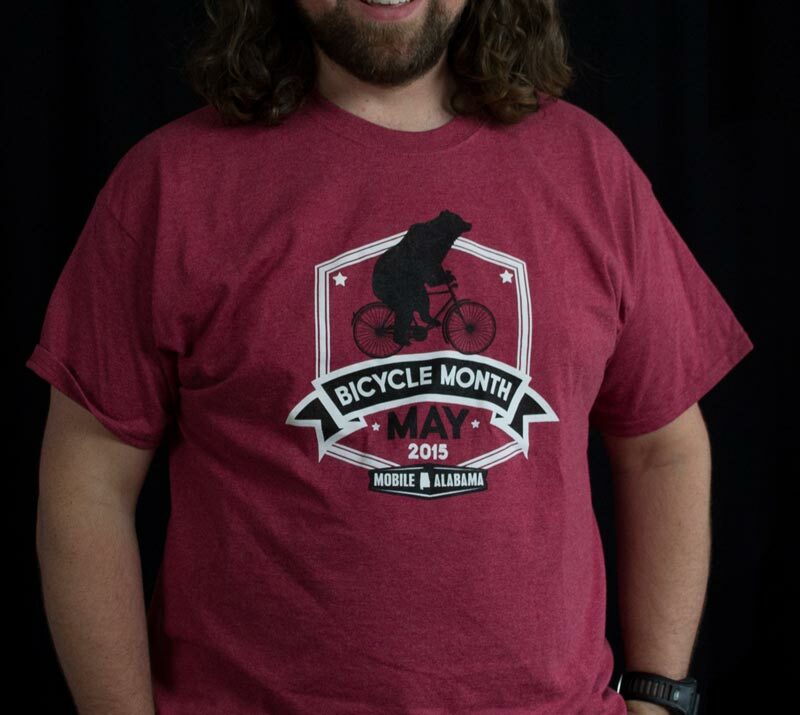 On Friday, May 15th, BicycleMobile.org is celebrating National Bike to Work Day and thanks to sponsorship from Chick-fil-A and Serda’s Coffee Company is giving away free breakfast to anyone riding their bikes to work downtown. 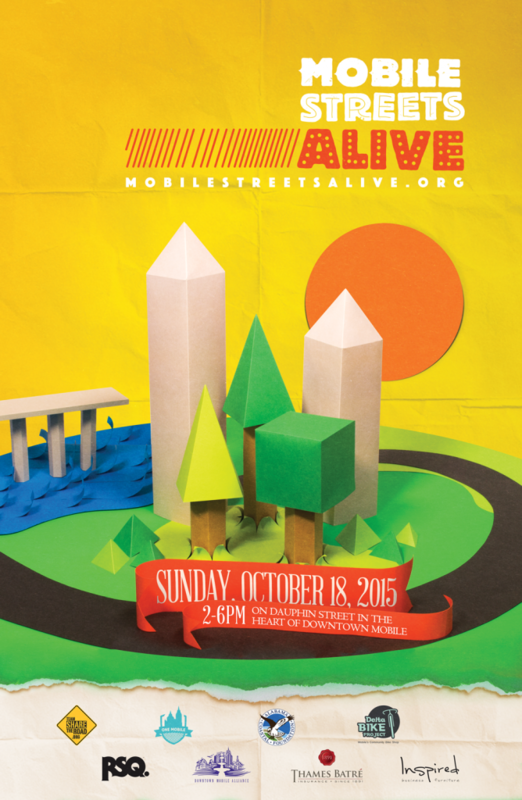 Mobile will join cities across the country in participating in this fun and free event. 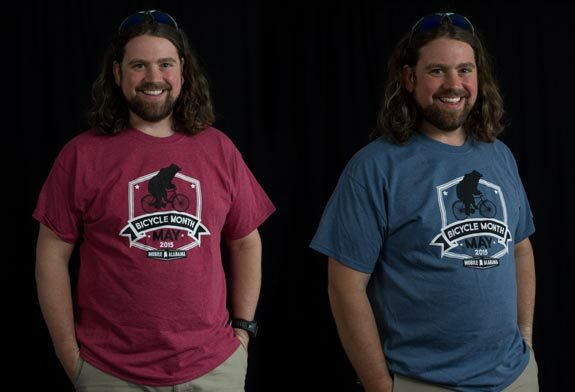 The National Bike to Work Day is the Friday of National Bike to Work Week (May 11-15) which is just one of many local events being held in conjunction with National Bike and Bicycle Safety Awareness Month. 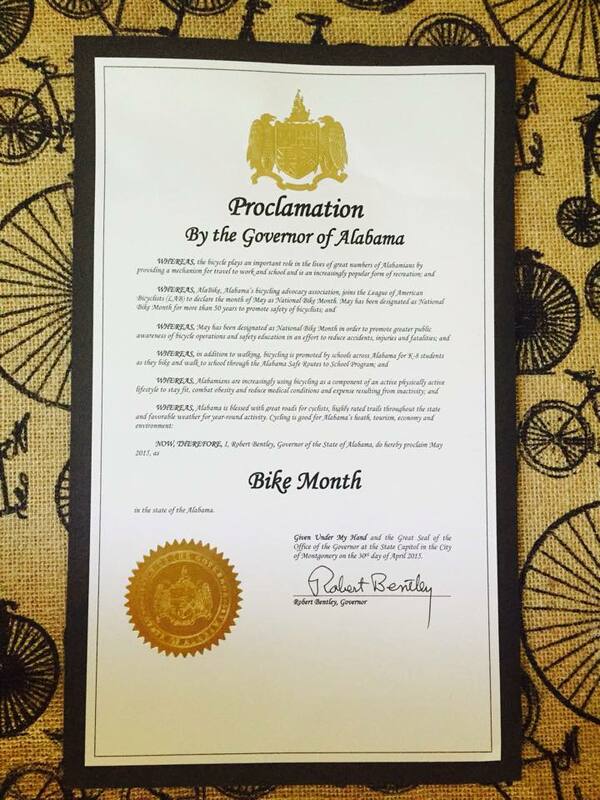 With proclamations from Alabama Governor, Dr. Robert Bentley; Mayor of Mobile, Sandy Stimpson; and the Mobile City Council, National Bike Month’s purpose is to showcase the many benefits of bicycling, and encourage more folks to give biking a try. BicycleMobile.org will have a station in Bienville Square in Downtown Mobile From 7am to 9am to register bicycle commuters and give away chicken biscuits courtesy of Chick-fil-A at RSA Trustmark, and drip coffee courtesy of Serda’s Coffee Company. There will also be goodies from other downtown businesses including Greer’s Downtown Market and Mobile Downtown Alliance. According to The League of American Bicyclists, more than half of the U.S. population lives within five miles of their workplace making a bike commute a feasible option for a significant portion of the community. Mobile’s flat terrain and grid-like streets make it easy to navigate across the city. Organizers are encouraging people to bike to work, to school, for exercise, or even to the grocery store. 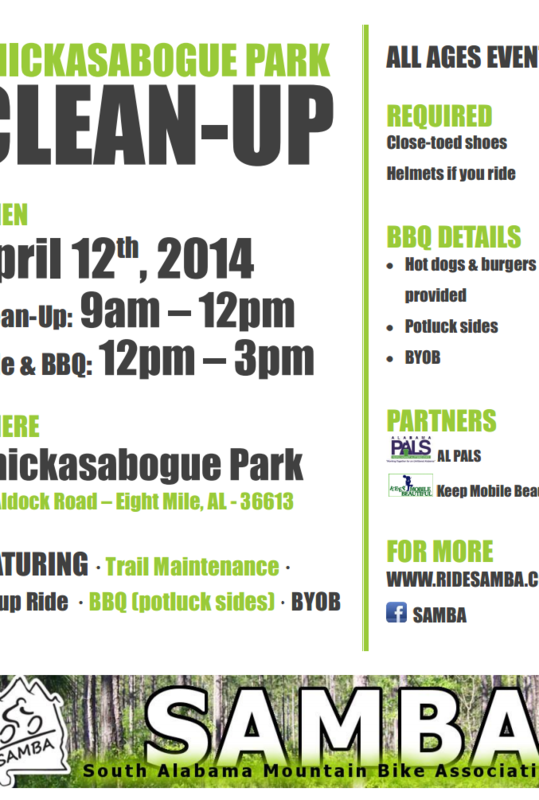 Join BicycleMobile.org, the Mayor, and the City of Mobile in this inaugural event. 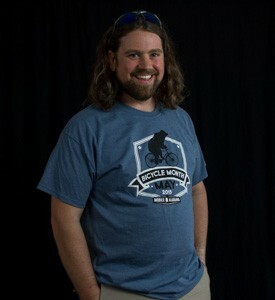 For anyone needing assistance in planning a safe route, please contact BicycleMobile.org (info@bicyclemobile.org) for personalized route suggestions. Businesses that invite their staff to participate in this event will be highlighted on BicycleMobile.org and through social media. Question: What has 100 legs, 100 wheels, wobbles when it rolls, can’t throw and steer at the same time and takes more than two hours to go three miles? 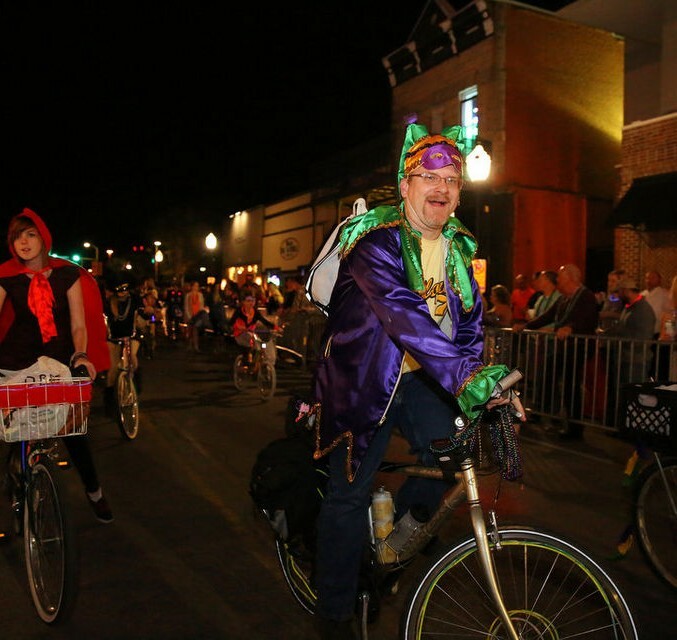 Answer: The motley crew of bicyclists who took the Order of Venus up on an invitation to ride in Monday night’s parade through downtown Mobile. This very unusual experience began to take shape in late January, when word began to spread via the Mobilians on Bikes page on Facebook: The Order of Venus had invited interested bicyclists to participate in their upcoming Mardi Gras parade. Details were spelled out on an accompanying events page. On Monday, night, in accordance with those instructions, elaborately dressed bicyclists began lining up their rides on Claiborne Street outside the Mobile Civic Center. Most had made some effort to decorate their bikes; everyone seemed to have come up with their own method of carrying beads and other throws. Mobile, Ala. – Mobile United is pleased to announce that they are the recipient of a two-year planning and assistance grant through the National Park Service’s Rails, Trail and Conservation Assistance Program. 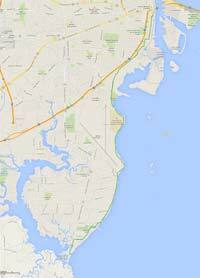 The grant will jump start planning and implementation of the Crepe Myrtle Trail. Awarded through the National Park Service’s Rails, Trails and Conservation Assistance (RTCA) program, the grant will provide staff assistance to engage stakeholders, plan the trails routes, create funding plans, and identify groups, individuals, business, local government officials, and nonprofits that will spearhead the project. “The momentum and support behind the creation of a permanent Crepe Myrtle Trail is higher than it has ever been,” said Mobile United Executive Director Katherine Pitman. 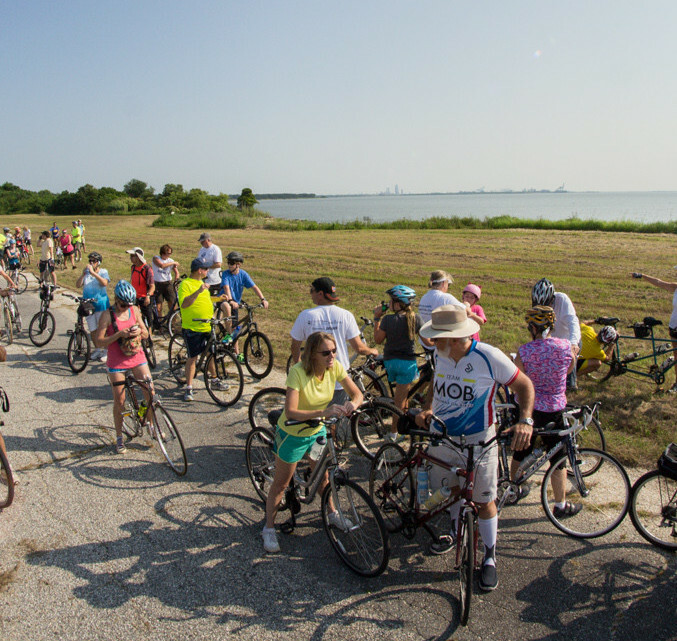 “More than a dozen organizations and 150 people participated in the inaugural Crepe Myrtle Trail Ride in June of this year and we’re thrilled to be able to continue our work on this great project for Mobile. Mobile United is grateful for the assistance from the RTCA program to undertake this critical first step in engaging all stakeholders in this planning process,” Pitman said. What started as an idea in the 1990’s, the Crepe Myrtle Trail arose as a solution to the lack of waterfront access in a waterfront City that aims to stretch a minimum of 14 miles worth of dedicated paths and shared lanes. The route begins at Three Mile Creek, runs through Downtown Mobile, hugs Mobile River, traverses the Peninsula of Mobile neighborhood and the beautiful shores of Mobile Bay and ends at the Dog River, while connecting at least seven existing parks, and other natural areas that have access and recreational opportunities. The trail will be a multi-use path that will be used by pedestrians and cyclists, tourists and locals, young and old, and people from all socio-economic backgrounds. The grant carries no financial award, but provides two years of project planning assistance. The goals of this phase of the project are to develop a Strategic Plan for the official creation of the CMT, to confirm or identify the most reasonable trail route and/or alternatives, and to create a conceptual design of the portions of the trail that pose the biggest challenges. The trail length will ultimately be decided by the community and other stakeholders, as the process of planning continues. Currently, the proposed route of the trail is approximately 14 miles. Opportunities exist for loop trails and extensions that will be useful for exercise outings, races, or other activities such as geo-caching, bird watching and sightseeing that could increase the size the trail complex to 25 or 30 miles. Mobile United’s mission is to develop, support and encourage a comprehensive network of trained and engaged leadership that is inclusive and adaptable to community needs, taking action on programs and projects that lead to a better quality of life for our citizens. For more information or additional inquiries, please contact Katherine Pitman for additional inquiries 251.432.1638 or at kpitman@mobileunited.org. More information about Mobile United can be found online at: www.mobileunited.org or on facebook at: https://www.facebook.com/mobileunited1. ALDOT will host two public hearings for the Mobile River Bridge project. Officials will be on site to answer questions about the proposed bridge and Bayway widening and solicit comments and concerns from the public. It is very important for as many proponents of a bicycle path to go to these meetings and make their voices heard. You must sign in to speak (2 min) and all comments must be on ALDOT’s comment form. There will be a court reporter as well. 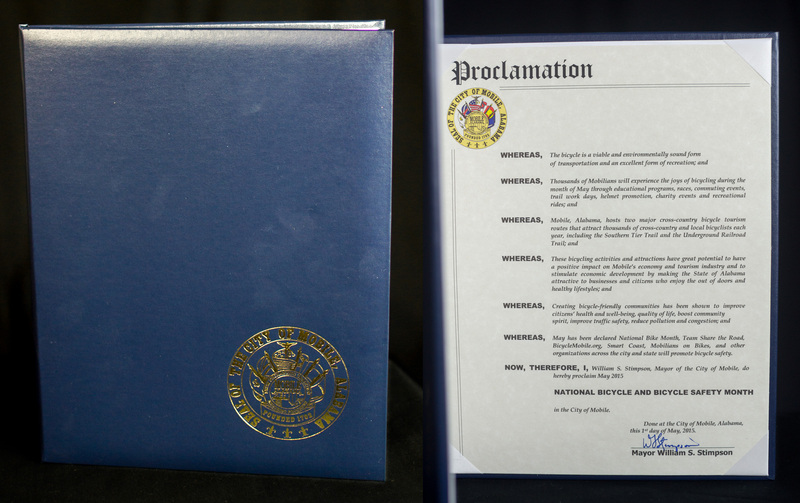 Tuesday, September 23, 2014 – 4 p.m. until 8 p.m.
Monday, September 29, 2014 – 4 p.m. until 8 p.m. Please use the following PDF as a resource as you sign up to speak. What are we requesting? : The BPAC petition simply expresses a desire and need for area residents to have a means to cross the Mobile River and requests that ALDOT & the Federal Highway Administration CONSIDER / STUDY including those facilities. The feasibility of such a project in terms of COST or SAFETY would have to be studied by those entities and if deemed infeasible then hopefully alternatives or mitigation would be considered. Dozens of bicycle and pedestrian paths exist on federal highway & interstate bridges (see list below) – safety standards are already developed and this is not a novel concept. Why should we request it? : The federal government is building the bridge in Mobile to make it easier for people to get through Mobile quickly. The bridge will have some negative effects in Mobile. The bike/ped path is an amenity that they are required by federal law to provide us. If the federal government is going to build this massive structure in Mobile that will last for hundreds of years and be used by our descendants then we need to make sure it is done right and not miss this opportunity. What benefits will it have? : The path has the potential to provide us the health and economic benefits outlined in the petition, as have happened with the similar Cooper River Bridge in Charleston where 66% of residents say they got more exercise because of the path. Additionally – biking infrastructure has been named the most sought after amenity for educated young people – which our economy needs – when deciding where to move. What will it be like? : Engineering has yet to be done but it will likely be a concrete barrier SEPARATED bike-pedestrian path. Again – these exist on numerous interstate bridges and have been proven to be safe. ALDOT has said that it will have a 4% grade – equal or less that the Charleston or Biloxi-Ocean Springs bridges. The assertion that only “world class” bikers will be able to use it is easily refuted by talking to an average area biker – not to mention the fact that most people could easily walk it. Will it delay the bridge? ALDOT has stated in MPO meeting that including the path at this point will not delay the bridge. In fact, NOT including the path will lead to a potential delay – as bridges built with federal funds are required to include consideration of bike-pedestrian facilities (see statute below). Not including them will likely lead to a lawsuit which will only mean more delays. Plus, its inclusion may help to mitigate some of the other potential concerns that would otherwise delay it. How will it be funded? 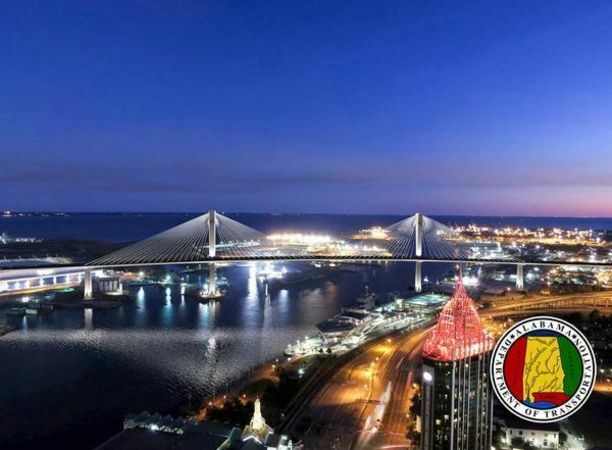 Funding for the bridge as a whole is yet to be determined, but the bridge is a federal project and will be funded primarily with federal dollars, with a smaller match by ALDOT. There is dedicated federal bike/ped funding for projects like these that can be utilized. If this path is not built then those dollars will simply go to another city. We will NOT get a tax rebate check, unfortunately. Since we are ranked #49 in the nation in bike infrastructure it will likely go to a city that already has better facilities than we do. Mobile has received relatively very little bicycle-pedestrian infrastructure dollars in the past and is already significantly behind most cities. • Alabama is ranked 49th in the nation in bicycle and pedestrian infrastructure, indicating severe deficiencies. Within Alabama, Mobile is has fewer facilities than other cities, with only one on-road bike lane. • Health and Quality-of-life: The Mobile Bay bikeway could be connected to the planned Three-Mile Creek linear park and Eastern Shore Trail – allowing people from West Mobile to Point Clear a safe avenue to exercise by biking or walking. As an example, 66% of Charleston’s Cooper River Bridge users say they are getting more exercise because of the bridge’s bikeway, and 85% of African American users say they are more active because of the bridge. Over 300,000 people per year now use the bikeway on that bridge. • Tourism: The bikeway would be challenging enough that it would attract enthusiasts, as well as the offering the general population a spectacular view of the bay. • Bike paths on Interstate highways or bridges are NOT prohibited by law. In March 2010 the U.S. Department of Transportation (DOT) released a policy statement that encourages state DOTs to include biking and walking accommodations on all bridge projects. • There are dozens of examples of interstate or other major bridges with bicycle accommodations: the Woodrow Wilson (I‐95 at the Potomac River), the George Washington Bridge (I‐95 over the Hudson River); I‐90 floating bridge across Lake Washington in Seattle; the Golden Gate Bridge (US 101) in San Francisco; and the Cooper River Bridge (US 17) in Charleston, SC. 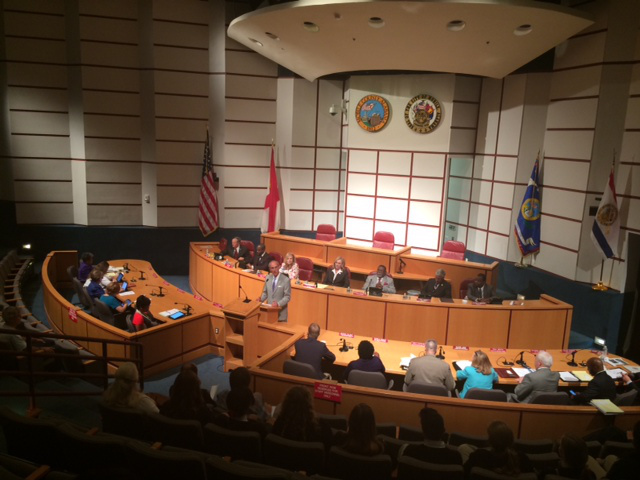 The Mobile City Council voted to pass a resolution supporting a bike and pedestrian path for the proposed I-10 bridge over the Mobile River at its July 29 meeting. The resolution passed 5 to 1 with District 4 council member John Williams voting against it. 11:19 a.m. – Elliot Lauderdale of Fairhope is talking about how he believes the average bicycle riders could handle the new I-10 Bridge and referenced the Biloxi bridge as a tourist destination because of the bike/pedestrian pathway . 11:26 a.m. – Williams said he can’t support the bike path on the bridge, but he does support connecting a bike path from Mississippi to Baldwin County. 11:31 a.m. – Councilwoman Rich said she believes the new Mobile bridge will be as large as the Golden Gate Bridge and that the pedestrian/bike path could add to its attraction. 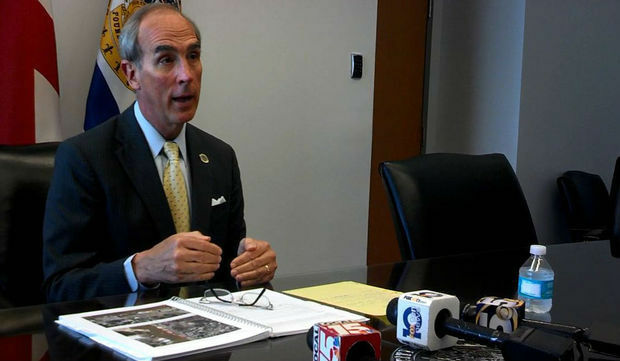 MOBILE, Alabama — Following a three-day, mayors only meeting in Texas, MayorSandy Stimpson has concluded that a major key to developing Mobile’s waterfront area lies in making Water Street walkable and easier to navigate, he said on Monday. The comments were made after Stimpson attended the Mayors’ Institute on City Design in San Antonio from March 5 through March 7, an annual gathering of mayors and urban planning experts from across the country. Mayors from places as far flung as Santa Rosa, Calif., and Somerville, Mass., were asked to present an issue in their cities for the group to consider. Stimpson’s presentation focused on one of the Port City’s most frustrating dilemmas: the underutilization of multiple waterfront properties, including the Alabama Cruise Terminal.